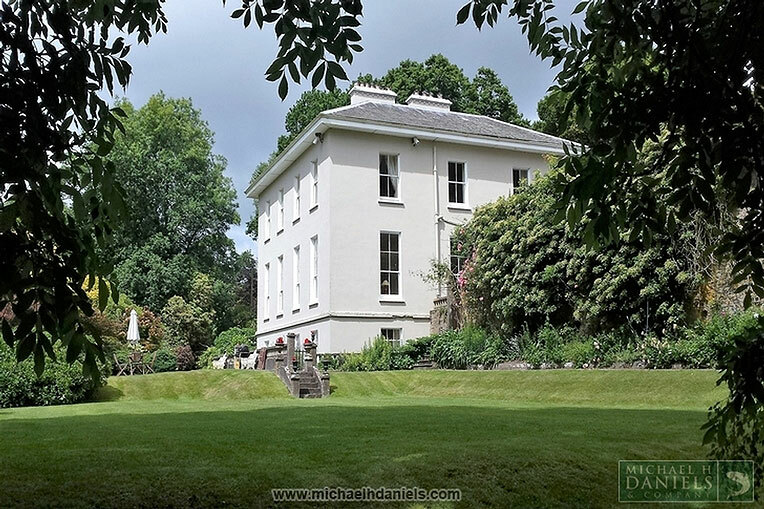 An elegant Georgian country house dated c1860, with impressive accommodation and delightful grounds of 2.71 hectares (6.70 acres) within easy reach of Cork City. Agent: Michael H Daniels & Co. Built by the Baldwin family in c.1860, Lissardagh House is an impressive example of typical middle-sized country houses of the eighteenth and nineteenth centuries. This fine house with its elegant Georgian lines retains much of its historic fabric and its classically inspired form and proportion offer spacious and light accommodation in a manageable and practical layout. The two-storey over basement house has a four-bay front and a three-bay side elevation with entrance porch. The gracious accommodation extends to some 495 sq metres (5300 sq ft) with four-over-two pane timber sliding sash windows and 3.7 m (12 ft) ceilings to the ground floor, providing the principle rooms with sunny southerly aspects overlooking the valley setting, gardens and grounds. The impressive accommodation includes entrance and staircase halls, three fine reception rooms, four bedrooms and an extensive lower ground floor. The house has been well maintained with the wiring and plumbing renewed in 2006, to include CCTV security and fire detection systems. Directly adjoining the house is a gated cobblestone yard with stone under slate traditional lofted outbuildings providing useful storage and workshop space. The stable yard comprises two separate modern steel portal-frame buildings, a hay barn (14m x 9m) and an American barn (27m x 11m) with 15 looseboxes and tack/feed room. The private and mature landscaped gardens and grounds are a particular feature of the property. Laid out in the 19th century they offer a high degree of shelter and seclusion with many specimen beech and oak together with a huge variety of other trees and colorful shrubs including azalea, magnolia and rhododendron. To the front of the house is a croquet lawn, with grass tennis court located to the side with a railed paddock below the house. The house occupies an elevated yet secluded private position and is located in a scenic rural area at the edge of the picturesque River Lee valley in mid Cork, a region of rich undulating farmland and wooded glens centered on the Inniscarra Reservoir, noted for its recreational amenity including fishing, sailing and water sports. Cork city and International Airport lie within easy reach, with rapid access via the N22 to the city ring road (20 minutes). Lissarda provides local amenities whilst Macroom and Cork provide a comprehensive range of shopping, leisure and financial services together with pubs and restaurants. There are many leisure and sporting amenities nearby. The area provides some of the finest fishing to the Rivers Lee and Bandon with golf at Killarney, Macroom, Blarney and Lee Valley. The lakes and mountains of Killarney, together with the beaches of West Cork are within an hours’ drive. Hunting is with the Muskerry and South Union with racing at Mallow (Cork Race Course) and Killarney.